I want to believe that I grew up eating freshly baked cinnamon rolls for breakfast. But for the life of me, I can't pull an example from anything in the depths of my memory. Hmmm. I find that strange. Because I love cinnamon rolls. I think my earliest memories of cinnamon rolls may actually be during college. During that time (and high school for that matter) I worked in music stores. The one I worked at for the longest period of time was in the mall. What is pretty much synonymous with malls? If you've ever walked through one, you've gotten an intoxicating whiff. But in the wee hours of the morning...okay, maybe not that wee anymore, but to a college student it was wee...when you're loading the register and straightening the store and blasting the music while the gate is still down, that's when you begin to smell it. That seductive cinnamon scent snaking its way down halls so empty they echo. I always imagined that it could pick me up and carry me (all cartoony like...floating through the air while the waves of scent levitate me through my nostrils) to those gooey, warm, ridiculously fattening Cinnabons. Sigh. So big you had to eat them with a fork. It was a form of torture to work by yourself some mornings. Because you'd be trapped in the store. Unable to make a mad dash down the hallway, through center court, turn right and go down another hallway practically drooling by the time you reach the storefront. Which has the most customers of anybody in the whole place at this time. Fast forward to the time immediately following college...and a short stint living in a hippie house in Milwaukee (...and worked at yet another music store...infinitely cooler and not in the mall) that I don't think has ever seen a cinnamon roll. You know that time frame when you I wind up back in your parent's home for a while. But all of my siblings are younger (as in anywhere from 7-12 years younger), so it wasn't like I was invading a quiet household or anything. Enter my first memories of cinnamon rolls at home. Cinnamon Rolls. From a tube. You know the kind. You unravel the metallic paper and pop the cardboard open with the back of a spoon. Plus, you could get Orange Buns. Variety is the spice of life, afterall. I'm not knocking 'em. I liked them. Okay, I like them. I even made them for my own family for years. Until I discovered the glories of cooking with yeast a couple of years ago. And now I know, it doesn't get much better than homemade cinnamon rolls. Unless of course you're in the mood for Orange Buns. Subtract cinnamon (or leave it...you choose) and add a mound of bright orange zest dripping with fragrant citrus oils. Add a side of salty bacon or meaty breakfast sausage...a few slices of sharp cheese. It's the breakfast of champions. Combine milk and yeast in the bowl of a stand mixer fitted with the dough hook. Let sit until foamy, ~10 minutes. Stir in sugar, butter, salt, and egg. Add flour and mix on low speed until dough comes together. Increase speed to medium-high and let knead until smooth and elastic, ~8 minutes. If dough seems too sticky while kneading, add a bit more flour at a time until it is just tacky. Transfer to an oiled bowl and cover with plastic wrap or a clean kitchen towel. Let rise until doubled in size, ~1½ hours. Beat softened butter, brown sugar, and orange zest in a bowl on high speed until smooth, ~2 minutes. Add salt, confectioners' sugar, orange extract and vanilla extract. Beat until smooth, another 2 minutes or so. Transfer ¼ c. of the filling to a bowl and stir in the orange juice. This is the icing. Transfer it to a small baggie and refrigerate until ready to use. Cover remaining filling and reserve at room temperature until ready to use. Turn dough out onto a lightly floured work surface. 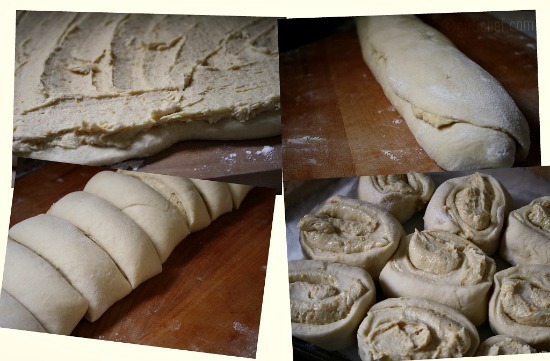 Using a rolling pin and your hands, roll and press dough into an 18" x 10" rectangle. Spread reserved filling evenly over dough. Lifting one of the long sides, begin tucking and rolling until you have a long "log". Trim the ends and cut into 12 rounds. Transfer rounds, cut side up, to a greased 9" x 13" baking pan. Cover with plastic wrap. Chill 6 hours or up to overnight. Preheat oven to 375° F. Uncover rolls and slide into oven. Bake until golden brown, ~25-30 minutes. Snip a small corner from the baggie of icing and drizzle over rolls while still warm. Enjoy! Now you've got me wondering how I could combine this with that cinnamon ricotta pullapart loaf! Mmmm citrussy! Omg, those buns looks extremely delicious..
Ha! I have a similar story. I worked at Bath & Body Works and from where our store stood we could smell the buttery pretzels baking down at Auntie Anne's. That beautiful aroma of the pretzels was such a welcome change from the scent of the bath products. I think the scent of bread baking has a way of calling people in. These look gorgeous! P.S. I think I need to subscribe to Saveur. Everyone is always cooking up such great recipes from it. My goodness, these buns are so enticing. I need to make these as they are so much better than the cold cereal I had this morning. I didn't grow up with cinnamon buns in my house either, but my mother had a friend who made them often. I loved going to her home after her morning of baking-it smelled heavenly! Mmmmm....these sound heavenly. I have never had a Cinabon roll before, but I do love cinnamon rols. The orange would be great! I wonder how it would taste with orange marmalade in it too? I wish I was at your house! I love how they caramelize at the bottom edge and fill the kitchen with intoxicating aromas. 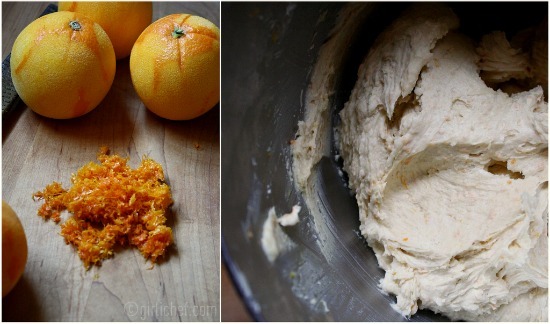 I love citrus and homemade bread...those are for sure wonderful for the breakfast! Those look utterly fantastic, my mom and I always had the canned rolls every Sunday for a treat. OH OH OH. My mouth is watering just looking at those beautiful photos. This recipe is on my to do list for next weekend. Geniales, me encantan como se ven. I am so making this. The idea of orange flavoring it alluring. And then you add the bacon! What a combination. Have a nice week Heather! Words fail me here. You are so talented at conveying the flavor and texture of your food in the photos. 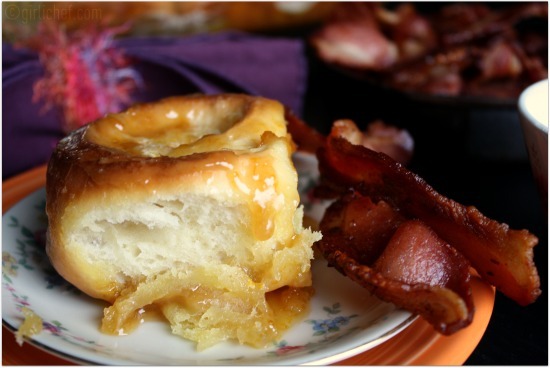 The closeup of the roll and the bacon is killing me, I have to try these. I can't remember the first time I had cinnamon rolls, but I do remember having those from the canister. Your photos and recipe are making my mouth water. If only it wasn't 11 pm here I'd get in the kitchen so we could have them for breakfast. Thanks for sharing, can't wait to try them. Ooooh, they look amazing! 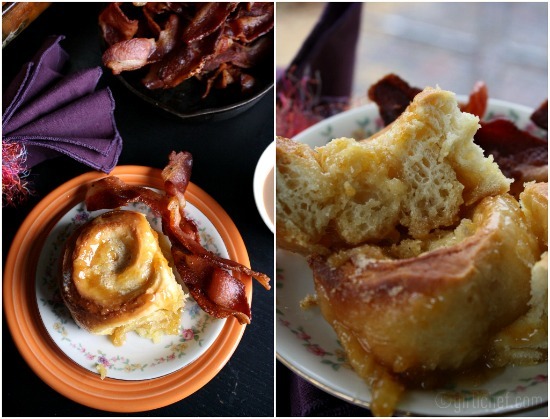 I have never thought to make cinnamon buns with anything but cinnamon! And I love the idea of orange here - somehow it sounds so much lighter. And I bet they smell wonderful! Yum! Looks so good. Reminds me of my mother's rolls. Can't wait to try these. The thing is - I'm trying to not eat that stuff. And then you show me the really good stuff and I start imagining the aroma and... I'm in trouble. There is nothing quite like the smell of cinnamon rolls baking. Unless, of course, you add citrus to them. Then it's a whole new ball game. Love these! I remember that heavenly smell. . . it was from T.J. Cinnamons in my mall. 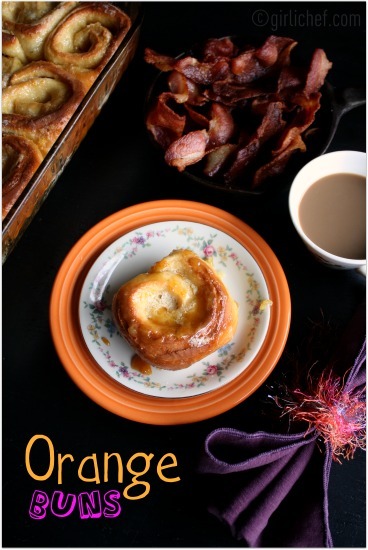 Orange buns sound scrumptious! Especially with a salty side of bacon. A perfect pair. Oh, Yum. I pinned it but I wish someone would come to my house and make them for me this weekend. heather! i just this minute finished reading saveur and i saw the orange buns. they reminded me of a roll i used to get at a club i belonged to in spokane, wa. i never was able to get the recipe, but it looked like i could use this recipe to fashion something similar. you might see a post from me soon :) your version look amazing! Thanks for the pin, Michelle! =) ...wish I could bring you a pan full. Heather - I love it! Orange Buns. I've never heard of them. I feel so sheltered and deprived! How could this be. It sounds so intriguing. orange buns, love it!! I loved the grapefruit rolls from Homesick texan with the citrus zing and I can imagine these babies would taste as sweet! Oh they look absolutely yummy and that orange filling is incredible. I remember from my childhood the same roll just the filling was caramel and there was one very amazing maple syrup which my mam was putting. 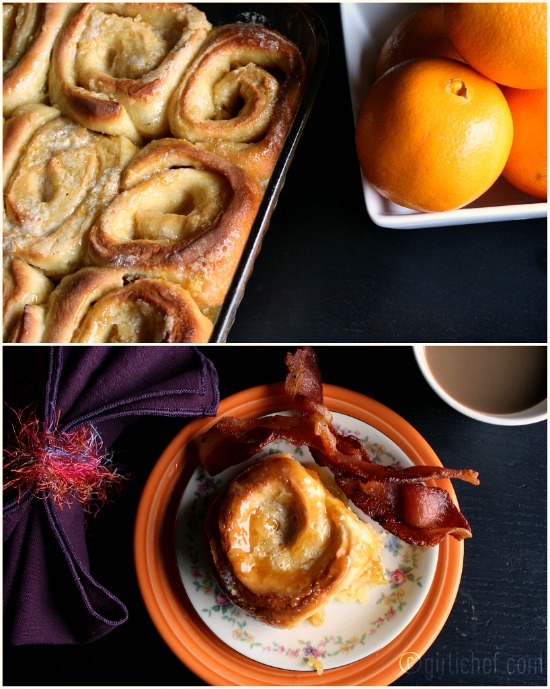 Mmmm how did you know....how did you know I have been craving cinnamon buns with an orange twist! Stunning! Fabulous recipe!